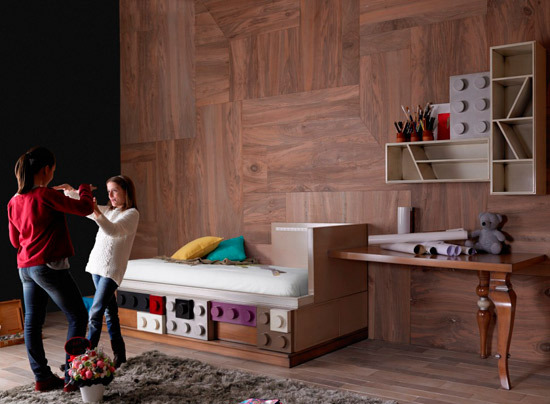 We’re sticking to the Lego theme for now, but for something very different than a playset, this Lego-inspired children’s bed by Lola Glamour. Yes, a Lego bed. But not just a pile of bricks stuck together. 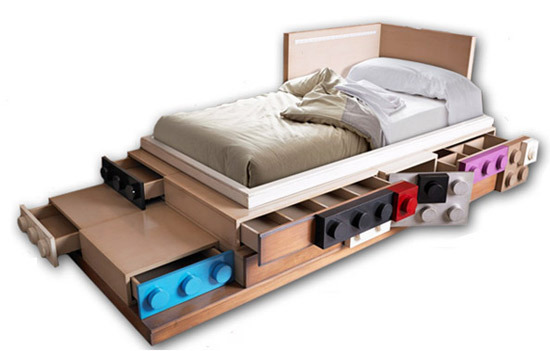 On the contrary, this is a handmade bed (and as such a customisable design), with the standard option featuring one cupboard and six drawers with Lego frontages, built into a solid wood bed with cherry veneer. The end result is pretty stunning, especially when matched with the storage units on the wall, also pictured here. What we don’t know is the price of this set-up, perhaps because the designs will be individual pieces. The best thing to do is to contact the maker / seller yourself. But note that you’ll also have to account for shipping if you aren’t based in their native Spain.